Later editions of the KJV do the same with Jn 8:6 in the Pericope Adulterae, where in italics appears the variant reading "as though he heard them not" (MH PROSPOIOUMENOS). 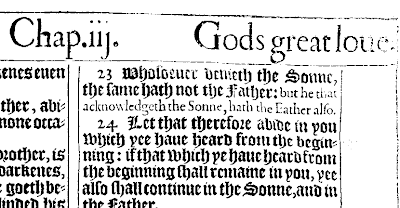 Again, these later KJV editions probably italicized the phrase due to its not being present in any English version before the Bishop's Bible, thus apparently following the pattern set by the original 1611 in 1Jn 2:23b. The KJV translators made quite a bit of use of Beza's 1598 edition. This was one case where they followed it, just as they were following the last 2 editions of Stephanus in John 8:6. This is the same sort of thing the translators of the NASB did in numerous places, for example Romans 8:6 where 'us' is inserted in italics, even though WH and NA omit ὑπὲρ ἡμῶν. Most versions include 'for us' anyway, but without bothering with the archaic convention of italics. I should add that you are right, PJW, about the small print indicating a lack of textual support. 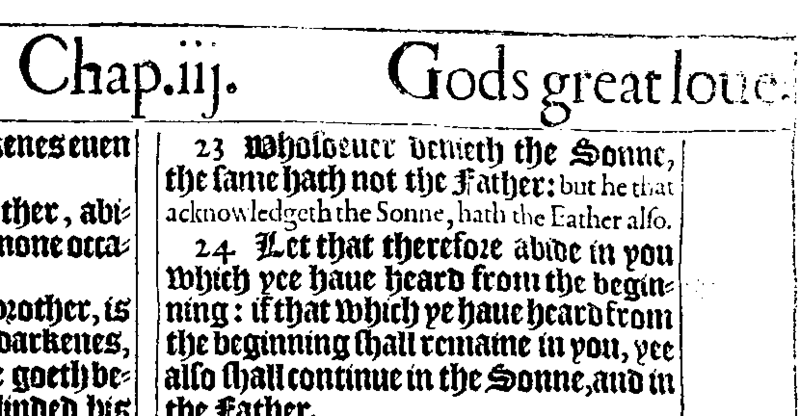 This can be seen in comparing 1 John 5:7-8 in all 80 editions of the English NT printed from 1534 to 1551 and noting that it was the usual practice to include the Johannine Comma in smaller print and enclosed in parentheses. In Jugge's revised edition of Tyndale in 1552, the verses were printed in normal type, as in Tyndale's first edition of 1526. This practice was then followed by the editors of the Geneva Bible, the Bishops Bible, and the KJV. By the time Bible editors again felt a need to call attention to the lack of textual support for the CJ, the practice of doing so with (round) parentheses, smaller font, or italics had gone out of use. Scrivenor notes that "this diversity of character" (a 'small letter in the text' as the editors describe it) was resorted to in the Great Bible, in order to direct attention to clauses rendered from the Latin Vulgate which are not extant in the Hebrew of Greek originals." Interestingly the Great Bible and the Bishop's Bible (the latter of which the KJV translators used as their base text for making changes in) both had the later words from 1 John 2:23 marked in this way. And indeed the latter part of hat verse was in the Vulgate and is still in the current Catholic Bible in English. Thanks Maurice, Daniel and Ron. Lots of useful information. I've just checked my Matthews Bible and what Daniel says fits there. With 65 characters, 1 John 2:23b happens to be the longest instance in the KJV of something thus rendered in italics. The next one in length has only 29 characters, being the phrase "he shall be chief and captain". I leave this as an exercise to the reader to locate the verse where this occurs. In this case, the modern term "and/or" fits nicely, because in either case, the facts are true. So, "and" is true, and so is "or".